SAN DIEGO, Calif. — MyKidisSafe, LLC announced today overwhelming industry response to its new Mobile Phone Software which was demonstrated for the first time at CTIA. Carriers, handset manufacturers and resellers were excited by the simplicity yet powerfulness of the software. The revolutionary software has many features including restricting use of a mobile phone while driving, restricting use during school and sleeping hours, monitoring for cyber bullying, monitoring text messages for 1,500 objectionable words and much more. “MyKidisSafe provides parents with suite of tools and information to build a bond with their children while guiding them through the formable years,” said Jay Lacny, CEO and Child Advocate of MyKidisSafe. “We’ve always said, ‘To Know is to Care.’ Here are some alarming statistics; 57 children per hour attempt suicide, 1 in 4 girls are sexually molested, 1 in 4 pregnant teenage girls have a STD and in Las Vegas alone 8,000 children went missing last year. If you want to protect your children against negative influences then MyKidisSafe is for you,” concluded Mr. Lacny. 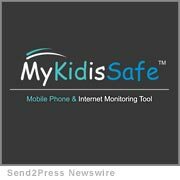 MyKidisSafe scans all incoming and outgoing text messages for approximately 1,500 objectionable words and notifies the parent upon a match. The software also features the option to restrict mobile phone use while driving using GPS. MyKidisSafe monitors patterns of increased activity for cyber bullying and those who may seek to harm your children. An easy to use Website is used to leave lunch time and breaks open for mobile phone use. Anyone may be added to a “Safe List” who children may make or receive communication to any of these unrestricted individuals. MyKidisSafe has a downloadable version of the software, is in discussions with carriers and handset manufactures worldwide and will offer it in 12 languages. MyKidisSafe, LLC is a privately held company located in San Diego, CA. Mr. Lacny founded the company based on personal experience of being the victim of sexual abuse along with 8 of his friends. MyKidisSafe also has a desktop version offering the same protection for parents scheduled to be released in May, 2008.